Plug-in hybrid plus 4MOTION. 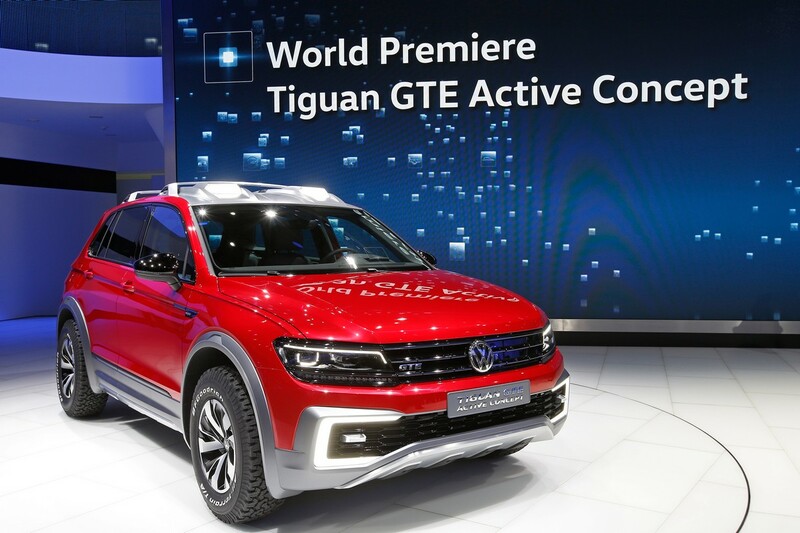 The Tiguan GTE Active Concept – which is equipped with a turbocharged gasoline direct-injection engine (TSI, 110 kW / 250 Nm) and two electric motors (front 40 kW / 220 Nm, rear 85 kW / 270 Nm) – shows that a plug-in hybrid drive (system power: 165 kW / 225 PS) can confidently supply all four wheels with propulsive force under off-road conditions. The all-wheel drive system – known as 4MOTION at Volkswagen – boosts traction and contributes to active safety on normal roads as well. Drive system components. The transmission used in the Tiguan GTE Active Concept is a 6-speed dual-clutch transmission (DSG) that was specially designed for hybrid use; the electric motor at the front is integrated into the transmission case. Other components of the 4MOTION plug-in hybrid drive, besides the motors and engine, include the lithium-ion high-voltage battery (energy capacity: 12.4 kWh) that can be charged either externally or via the TSI, power electronics for the front motor and a second power electronics module integrated in the electric motor at the rear (it converts the direct current from the battery into alternating current for the electric motors) and a charger. Drive types – rear-wheel and all-wheel drive. Depending on the driving program and drive modes, the Tiguan GTE Active Concept is either driven by the rear wheels or by all four wheels. As a default, the concept car always starts off electrically in the zero-emission E-mode. If the battery is sufficiently charged, the rear electric motor powers the car by itself; now the Tiguan GTE Active Concept is a rear-wheel drive car – the TSI and the front electric motor are decoupled from the drivetrain and are shut off to save on energy. However, as soon as the driving situation demands it, or the driver manually activates a related mode, the front electric motor is also engaged in fractions of a second. 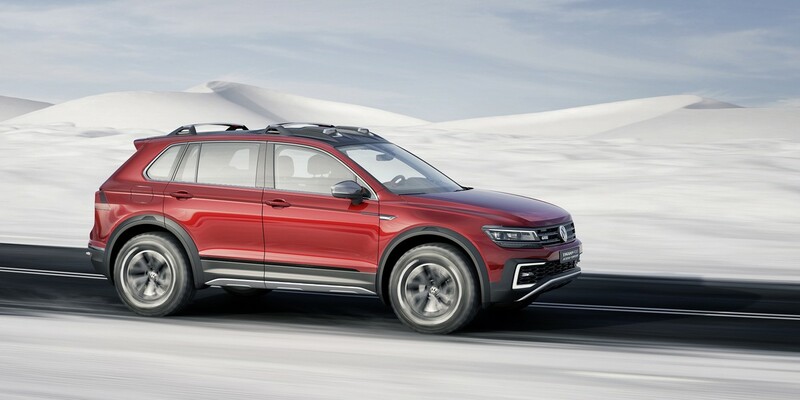 The Tiguan GTE Active Concept is now a zero-emission all-wheel drive vehicle whose electric motors are supplied with energy from a lithium-ion battery. The concept car can cover up to 20 miles before the gasoline engine is needed. In E-mode, the Tiguan has a top speed of 75 mph or 120 km/h. Electric propshaft. If the battery is no longer sufficiently charged, and the system requests that the electric motor on the rear axle be supplied with electricity (for dynamic handling reasons or in the Offroad program) by the front electric motor and gasoline engine, the TSI is started up and engaged (Hybrid mode). In this case, the front electric motor serves as a generator for the rear electric motor. Since the energy for driving the rear axle flows "by wire" and not mechanically, we speak of an "electric propshaft". In Hybrid mode, the Tiguan GTE Active Concept may automatically use the TSI and/or the electric motors, depending on the energy level of the battery. Driving programs: Onroad, Snow, Charge, Battery Hold, Offroad. The rotary/push-button switch of the new 4MOTION Active Control unit is located on the center console. The driver can use this control to select one of five driving programs: Onroad (Eco, Sport, Comfort, Normal or Individual), Snow, Charge (battery is charged while driving), Battery Hold (maintains a constant battery charge) and Offroad (Rocks, Sludge & Sand or Gravel). When the Tiguan driver turns the round switch to the left, the on-road programs Onroad, Snow, Charge or Battery Hold can be activated. When the switch is turned to the right, the user can access the Offroad programs. In off-road duty, the 4MOTION Active Control can adapt the assistance systems to the given driving situation within seconds with just one user operation – a further safety benefit. The same applies to the Snow program, which optimizes safety in winter road conditions. Drive modes: Hybrid, E-Mode, GTE. The E-mode and GTE mode are activated by separate buttons on the center console. When the driver presses the E-mode or GTE-mode button a second time, the car switches back to Hybrid mode. 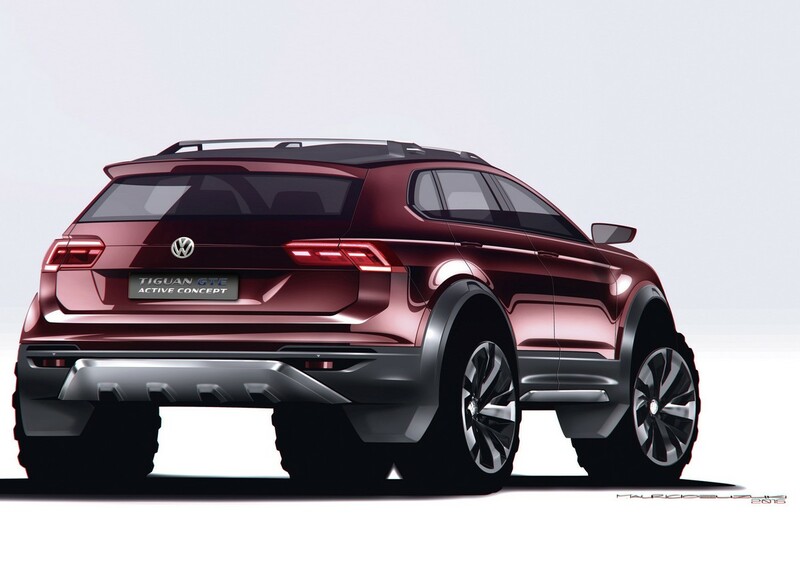 As mentioned, the Tiguan GTE Active Concept may operate with either rear-wheel drive or all-wheel drive in Hybrid mode and in E-mode. In the very dynamic GTE mode, the car automatically switches to all-wheel drive. The GTE mode is a USP of all Volkswagen cars with a plug-in hybrid drive. The transmission, accelerator pedal and steering characteristics are made noticeably more dynamic, and the TSI engine's tuning is also more performance oriented. 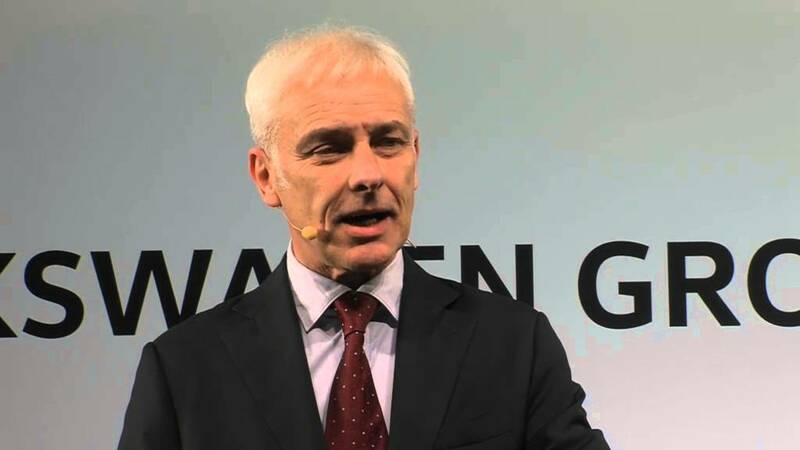 In addition, the turbocharged gasoline direct-injection engine and the electric motors work together in the GTE mode and in kickdown/boosting. This makes the full system power of 165 kW / 225 PS available – and in this case the Tiguan GTE Active Concept, with its top speed of 120 mph / 193 km/h, accelerates to 60 mph in 6.4 seconds. Depending on the given driving situation, the SUV may use the TSI by itself or switch over to the additional "Coasting" or "Regenerative braking" hybrid modes. Coasting function. As soon as drivers take their foot off the accelerator pedal, the engine and all motors are shut down and disengaged from the drivetrain, provided that the battery is sufficiently charged. This is known as "Coasting". No emissions are generated here either. Regenerative braking. When drivers take their foot off the accelerator pedal or brake when the battery is insufficiently charged, both electric motors work as generators and feed the energy generated during braking into the lithium-ion battery. In this case, too, the TSI is shut off and disengaged. Driving with the TSI. When the gasoline engine alone is powering the vehicle, the concept car is a front-wheel drive vehicle only. Here, the Tiguan GTE Active Concept is very fuel efficient as well, thanks to the efficient technology of the turbocharged direct-injection engine that has a displacement of just 1.4 liters. SUV has taut proportions. 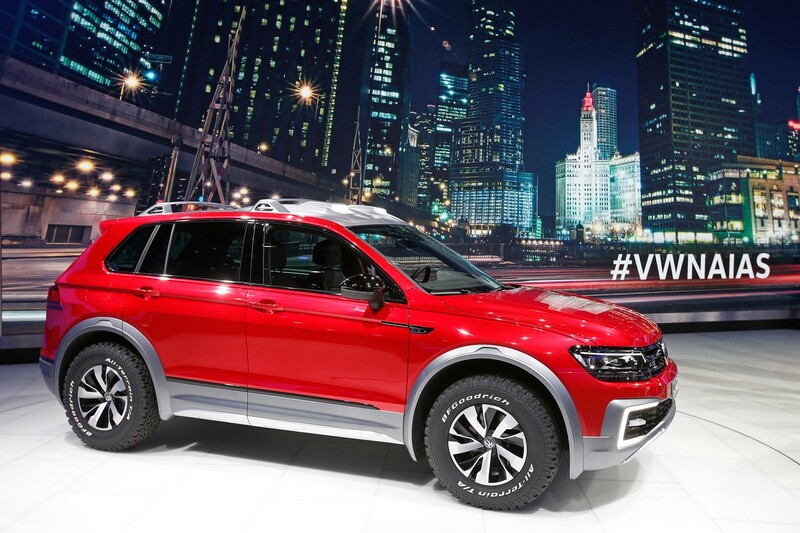 The second generation of the Tiguan – which includes the show car being presented in Detroit – is, as mentioned, the first SUV from the Volkswagen Group to be based on the modular transverse matrix (MQB). 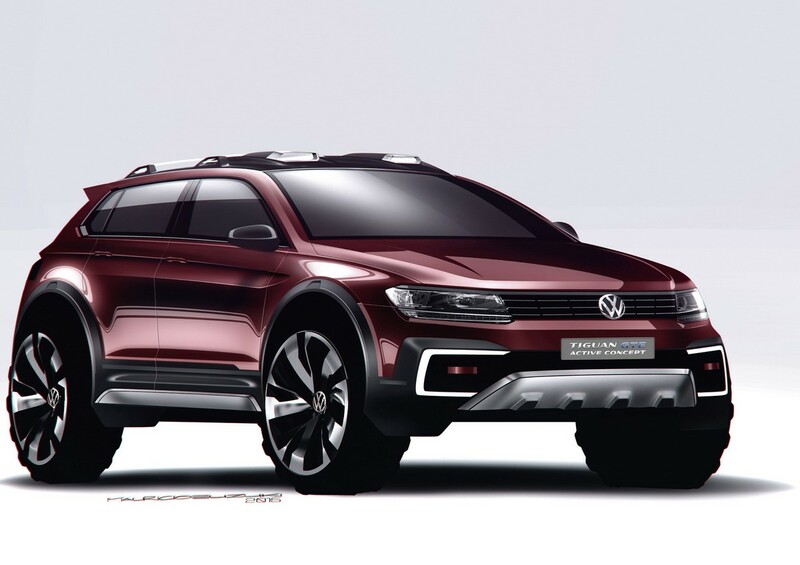 The Tiguan GTE Active Concept is 176.9 in / 4,494 mm long, 74.8 in / 1,899 mm wide and 69.5 in / 1,766 mm tall. Like all MQB vehicles, the concept car has a large wheelbase (105.5 in / 2,681 mm) and an especially good package. That is precisely why the five-seat Tiguan GTE Active Concept also offers tremendous space in the passenger compartment and the boot. SUV with charisma. Painted in brilliant, shiny Dragon Red Metallic, the Tiguan GTE Active Concept makes it clear at first glance that it not only wants to play. The team of designers and engineers who were responsible for the concept car developed an entirely new set of all-terrain features customized for the downtown areas of large cities. These features are both durable and tailored to the demands of globetrotters. The classic off-road parameters of the body show this. Sporting an off-road front end, they were all further improved compared to the already excellent production version of the Tiguan. For instance, ground clearance under the axles was increased from 7.1 in / 180 mm to 8.9 in / 225 mm, and the maximum ground clearance under the car was increased from 7.9 in / 200 mm to 9.6 in / 245 mm. The approach and departure angles were improved as well: from 25.6 to 26.1 degrees in front and from 24.7 to 29.9 degrees at the rear. The maximum ramp angle for overcoming road bumps grew from 20 to 24.7 degrees. Front end has underbody guard. The production version of the new Tiguan – which was shown in autumn 2015 at the International Automobile Exhibition (IAA) in Frankfurt – already showed an authentic SUV design and a charismatic front end. This pure and precise alignment is reinforced by the all-terrain features of the concept car. 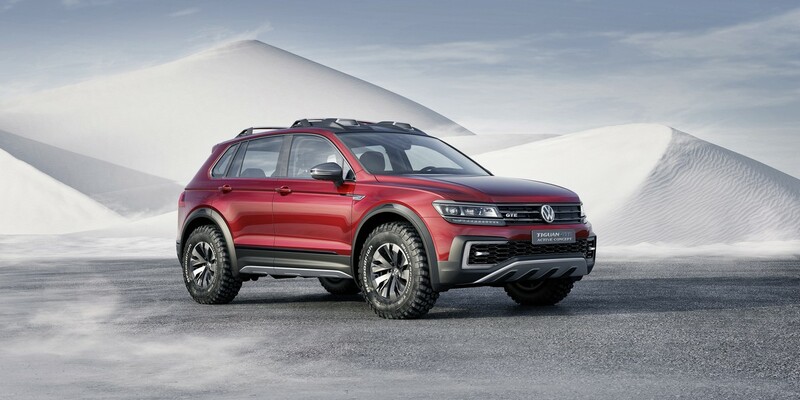 Viewed from bottom to top, first there is the underbody guard whose design and construction make it clear that the Tiguan GTE Active Concept was also designed for excursions off the paved trails. The underbody guard, in matte aluminum, is equipped with four solid black polymer protectors which, first, protect against contact with stones and bushes and, second, can be easily replaced after an extreme trip through the outback. The front bumper is also trimmed with an all-terrain element made of durable polymer in the new color "Dark Graphite" (a matte anthracite-gray). On the exterior, this element is bordered by a distinctively designed frame, which integrates the c-shaped LED daytime running lights that are typical of the Volkswagen plug-in hybrid and electric models. The framed lower air intake is produced from a polymer that is just as rugged. 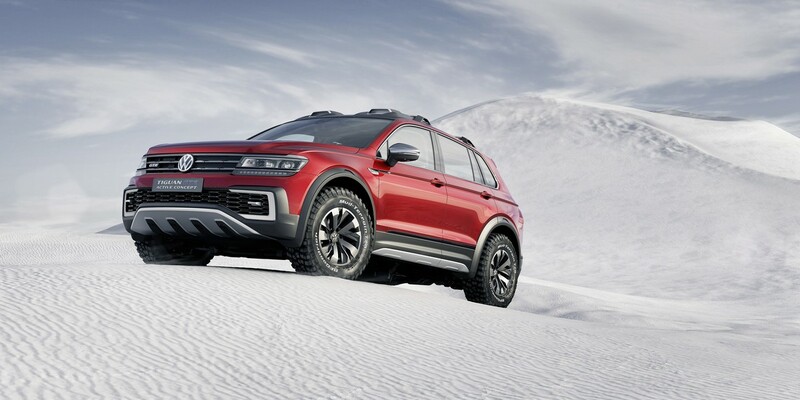 If the Tiguan GTE Active Concept is needed to pull another off-road vehicle in reverse from the muck, there are two aluminum-colored metal hooks in the air intakes on the left and right sides of the front end. The headlights are designed entirely in all-LED technology. Sophisticated: elements finished in "Dark Chrome Glossy" on the three crossbars of the radiator grille; the upper and lower bars are each continued up to the headlights. In this way, the headlights and radiator grille form a single, wide and powerful unit. Roof section has auxiliary LED spotlights. Also equipped with a dark all-terrain module is the roof section; the screw-mounted top is made of fine aluminum. Integrated here are high-strength cross-rails that can serve as a base support for skis or other equipment items. They too are made of aluminum, but they are the color of the metal, which contrasts with the black roof. At the front, the roof also has two flat LED auxiliary spotlights, which – like the cargo cross-rails – are framed in matte aluminum. Side profile with aluminum side sills. 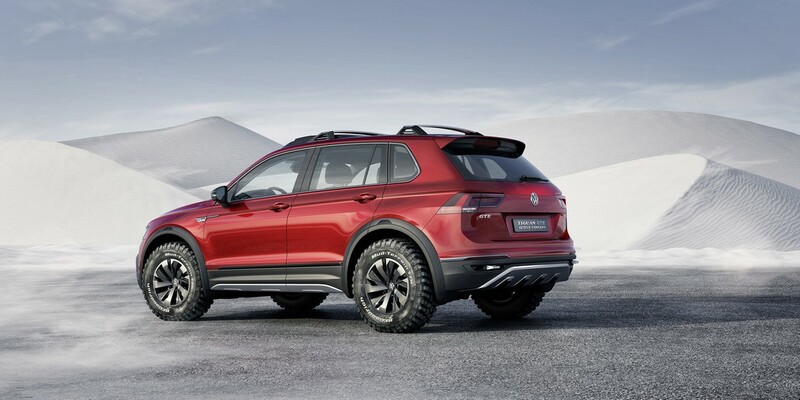 On the sides, the interplay of the all-terrain body elements and the distinctively profiled off-road tires clearly identify the Tiguan GTE Active Concept as an off-road vehicle among SUVs. The 16-inch tires sized 245/70 offer optimal traction on slippery surfaces due to their off-road tread that extends into their sides. The rugged, sporty-looking alloy wheels have spokes and are finished in high-gloss black. The powerful design of the Tiguan GTE Active Concept gains even greater presence by its wheel well extensions in "Dark Graphite". Between the wheels, the door and side sill trim elements (also in "Dark Graphite") were specially developed for the concept car. These trim elements are protected by underbody guard elements made of matte aluminum toward the bottom. Fine side details: the caps of the exterior mirrors, which are finished in "Dark Chrome Glossy", match the trim elements at the front end; their color coordinates perfectly with the side window frames. Underbody guard at the rear. 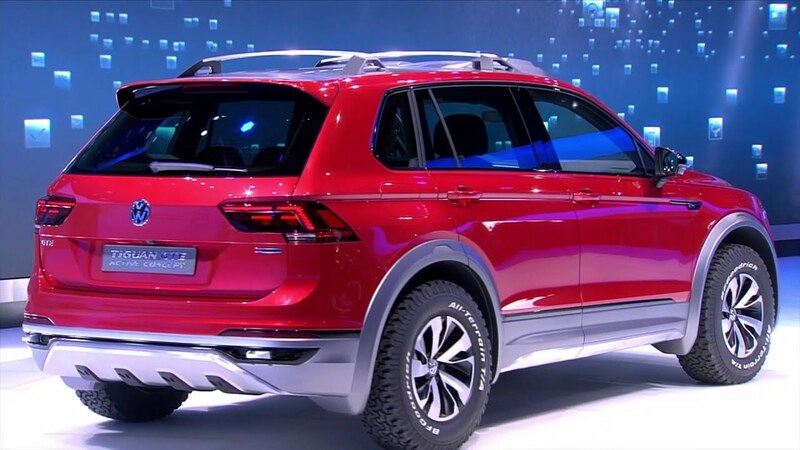 Like the front and sides, the rear body of the Tiguan GTE Active Concept is also equipped with a solid underbody guard made of matte aluminum. Like the front end, four interchangeable polymer protectors are used here as well. The lower area of the bumper is protected by all-terrain trim that is also anthracite colored. So, these trim elements are found all around the car body. Above the trim, the outside of the bumper is also trimmed in anthracite-colored anodized trim strips. Last but not least, the SUV also has two solid aluminum-colored metal hooks for towing and freeing up other stuck vehicles or for removing tree branches that are blocking the trail. Personalized interior. The design team also customized the interior space of the Tiguan GTE Active Concept to coordinate with the all-terrain exterior. For instance, the trim strips of brushed, dark aluminum ("Blade" design) matches the materials used for the front and rear underbody guards and for the add-on roof components; the trim strip wraps around the instrument panel and the door trim panels, defining their style. In addition, accents in dark chrome ("Black Night" design) create a connection to the exterior design. These accents include the steering wheel trim. Meanwhile, fine "Dragon Red" strips in the frames for the air vents repeat the color of the exterior paint. Another new design element is the two-tone Nappa leather upholstery in "Rhodium Grey" and "Dark Graphite": The seat surfaces, armrests and door inserts are all upholstered in the bright "Rhodium Grey". The "Color & Trim" design team used "Dark Graphite" for the side surfaces and seatbacks (outer surfaces). The leather surfaces of the seats and door inserts in "Rhodium Grey" exhibit a three-dimensional pattern of rhomboidal shapes that transitions in size (from small to large). Along with their size, the rhomboids also change in their three-dimensionality. The large rhomboids are embossed deeper, while the embossing of the small rhomboids is barely perceptible. The same design pattern was transferred to the milled aluminum surrounds of the woofers in the doors. The open leather edges also reflect a high level of craftsmanship; they are worked into the seats, head restraints, armrests and steering wheel – a narrow red dyed stripe between the different leather surfaces. Using these open leather borders along with a new processing technique made it possible, for the first time, to produce the leather-trimmed steering wheel without stitching. Avant-garde display and control elements. Overall, the interior also emphasizes the car's sporty SUV character. Fitting in with this picture is the driver-oriented design of the instrument panel with its display and control elements that feature avant-garde styling and are perfectly thought-out. 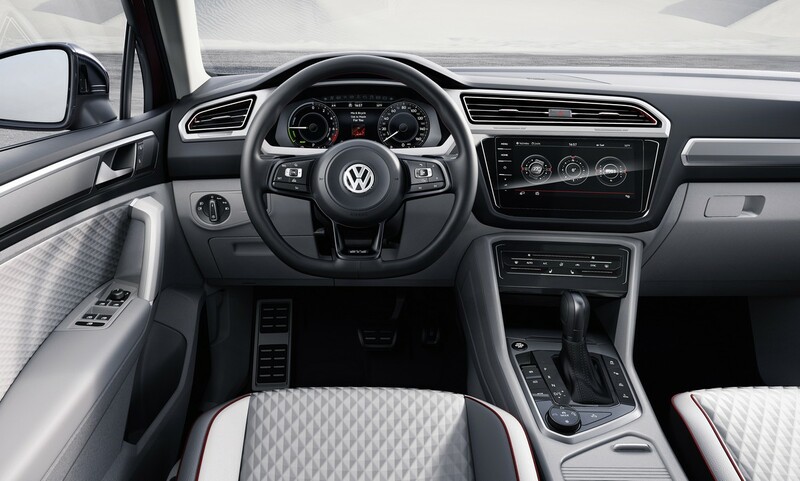 The visually dominant equipment elements on-board the Tiguan GTE Active Concept are the digital Active Info Display (in front of the driver) and the newly developed, next-generation infotainment system. Directly beneath its large touchscreen – which can also be operated by gesture control – is the center console with climate controls. Here, all of the controls are designed as touch sliders, including for the seat heating function. The center console itself is dominated by the high position of the gear shifter with an array of control buttons arranged around it. The latter is longer on the driver's side, because this is where the multifunction switch for the new 4MOTION Active Control is located. Next generation infotainment system. The top system of the next-generation modular infotainment platform (MIB) at its final production level which is now being shown deserves special attention. The two exceptional features of this system are a large 9.2-inch high-resolution touchscreen (1,280 x 640 pixels) and gesture control. All functions and displays were also embedded with a screen surface that is sophisticated and clear as glass; on the left – facing the driver – are five sensor buttons (Menu, Home, On/Off and Volume "+" / "–"). The 8.2 in (209 mm) wide and 4.1 in (104.6 mm) tall home screen consists of a large main window and two configurable tiles (positioned on the right side on the home screen), each of which is 1.7 in (42 mm) tall and 2.3 in (60 mm) wide. They can be filled with ten different types of content – e.g. Media (including cover image) or Phone (including image of the conversational partner). In addition, it is possible to use the entire surface of the home screen for one function – to show the navigation map in large format, to show special instruments of the Offroad mode (steering angle, compass, elevation indicator) or to show, via App Connect, the smartphone apps of Mirror Link™, Android Auto™ (Google) or CarPlay™ (Apple).